Istanbul is a vibrant city full of cultures, colours and histories. 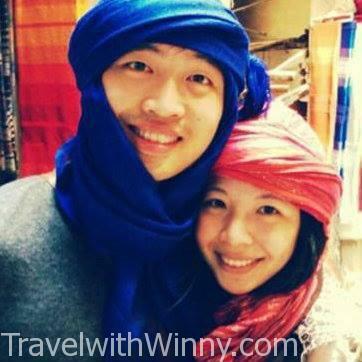 It is one of the largest cities in the world with population of 14 million and growing! Located on both sides of the Bosphorus strait, it is the only city in the world that spans across Europe and Asia physically and culturally. It is almost impossible to run of out things to do in Istanbul. However if you have limited time like us, I will share with you what we did during our two days in Istanbul! 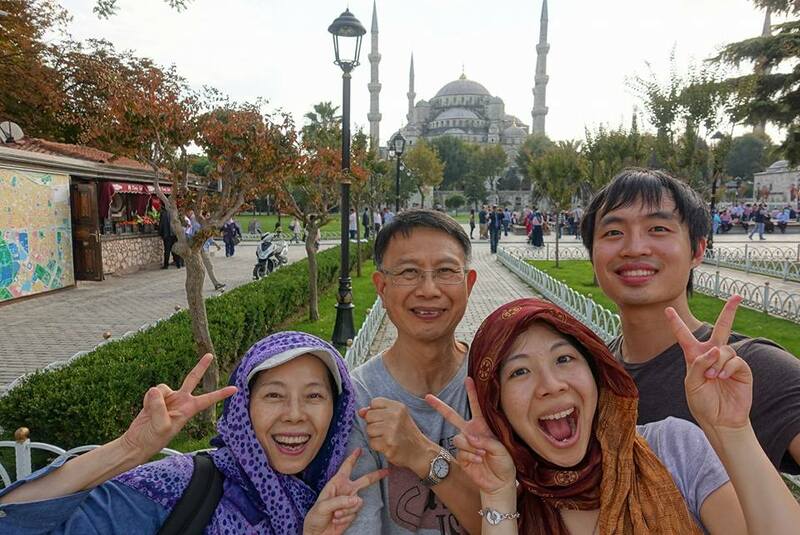 My parents flew in from Taiwan and we flew in from Australia for a family reunion in Istanbul! Although the transport system in Istanbul is quite reliable, it is wise to stay near Old Town (Sultanahmet) as most historical attractions are around this area. We stayed in Double Tree by Hilton Istanbul – Old Town. It was quite centrally located and the service was quite good. A review of this hotel will be coming soon. Buy a 5 Day Museum Pass Istanbul from an attraction or from hotel concierge for 85TL. It can not be purchased online. You can visit the website and see which location is most convenient to acquire the pass. We got ours from the concierge at the hotel. 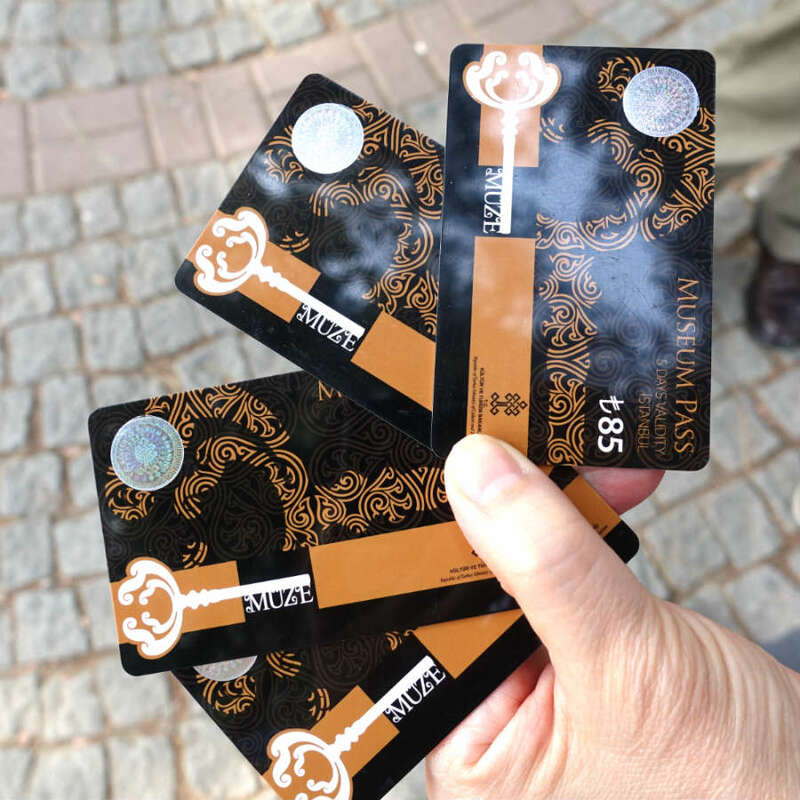 Our Istanbul Museum Passes did save us lining up times. Taxi from Istanbul Atatürk Airport to Old Town Sultanahmet is around 45TL. There are no day time and night-time fare in Istanbul. Make sure you have small notes before riding the cab as cab drivers in Turkey seems to think the excess money is for tips. Break your notes up by purchasing something cheap from the airport stores. 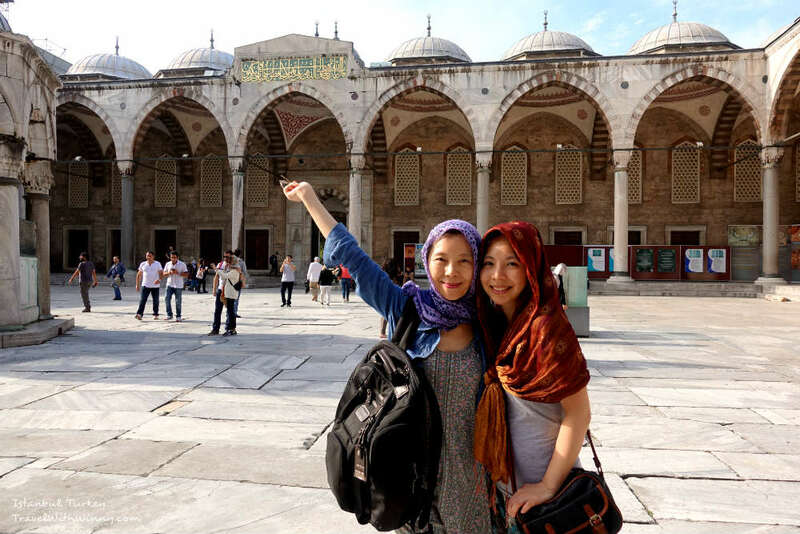 In Old Town Sultanahmet, you would be able to visit most of the historical sites. The following is a guide to visit all these sites in a logical order. The amount of time spent at each site varies depending on your interest. We did go through almost all the iconic locations in Old Town on Day 1, however we were travelling with my parents and their English isn’t great so we didn’t spend very long in the museums. Due to the close proximity of our hotel, our first stop for the day is Hagia Sophia Museum. The entrance fee costs 30 TL without a museum pass. It is one of the most impressive monuments in the world in terms of art, architecture and history. 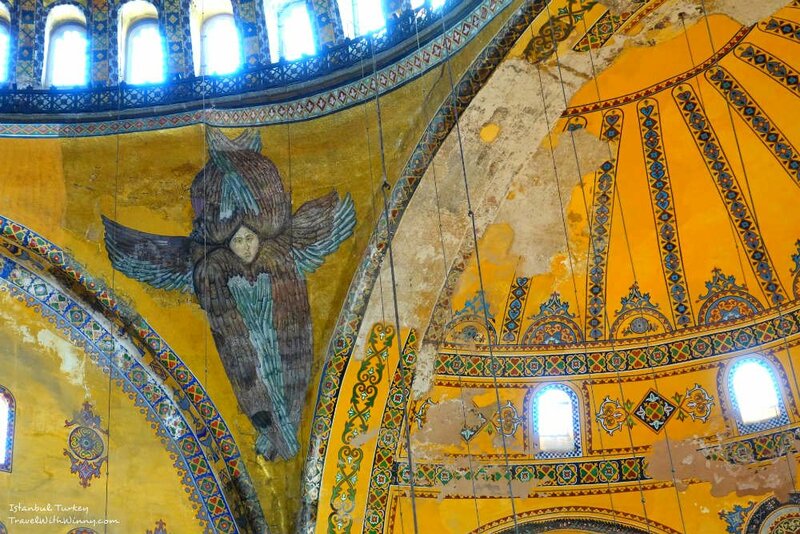 Hagia Sophia has a rich history. When it was constructed in 537AD, it served as a Greek Orthodox cathedral until 1453. It was briefly converted to Roman Catholic cathedral under the Latin Empire between the years 1204 and 1261. When the Ottoman Turks conquered Istanbul in 1453, the building was converted into an imperial mosque and served as so until 1931. 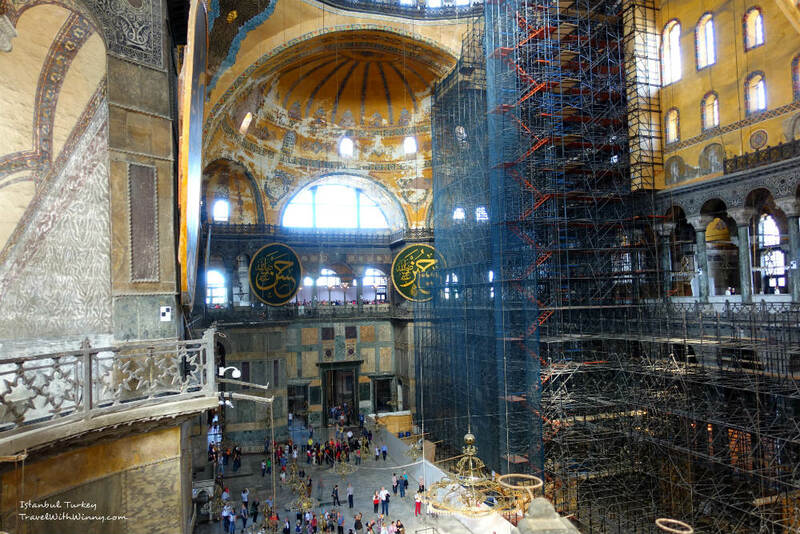 From 1935, Hagia Sophia was opened again as a museum. Amazing patterns inside the domes. Hagia Sophia is famous for its enormous dome and was the largest cathedral for almost a thousand years until Seville Cathedral was completed in 1520. Hagia Sophia is one of my favorite place in Istanbul. 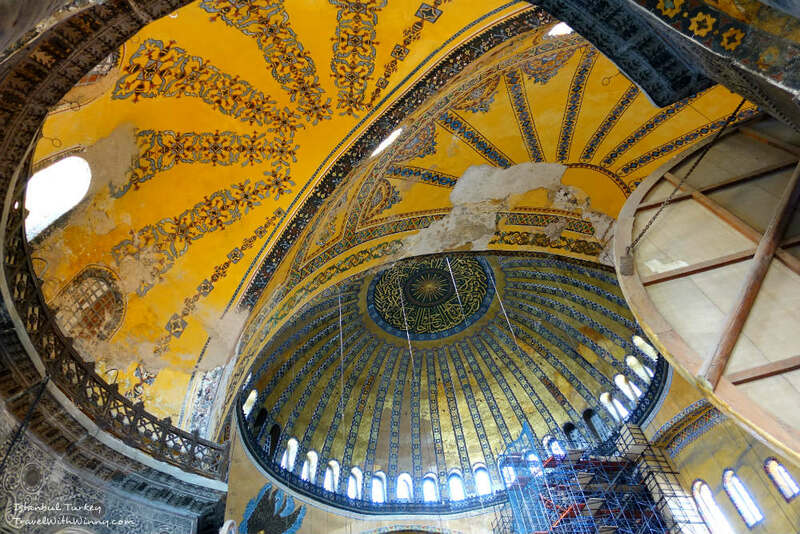 The golden mosaics were stunning and breathtaking. Many images were of Jesus, saints, Virgin Mary and different emperors and empresses. Even the geometric patterns were well presented, one can easily spend 2-3 hours admiring these artifacts. 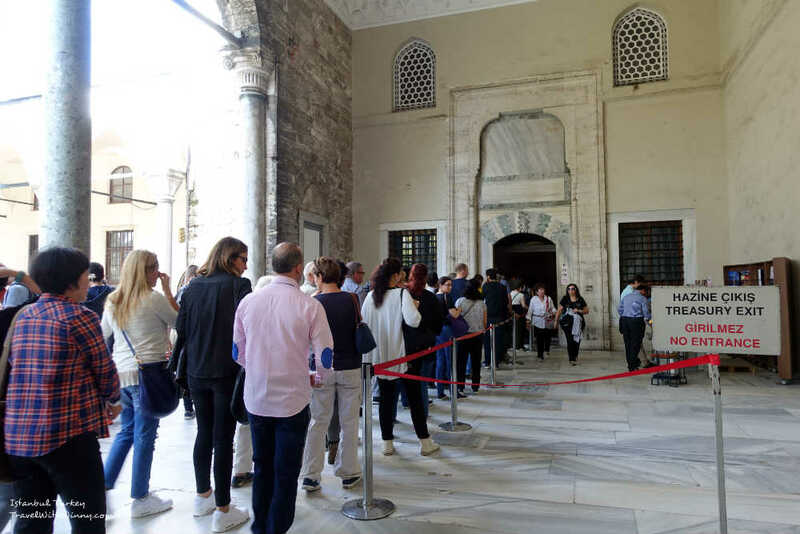 Hagia Sophia used to be closed on Mondays, however the newest information from the official website says it opens everyday from 9 am. 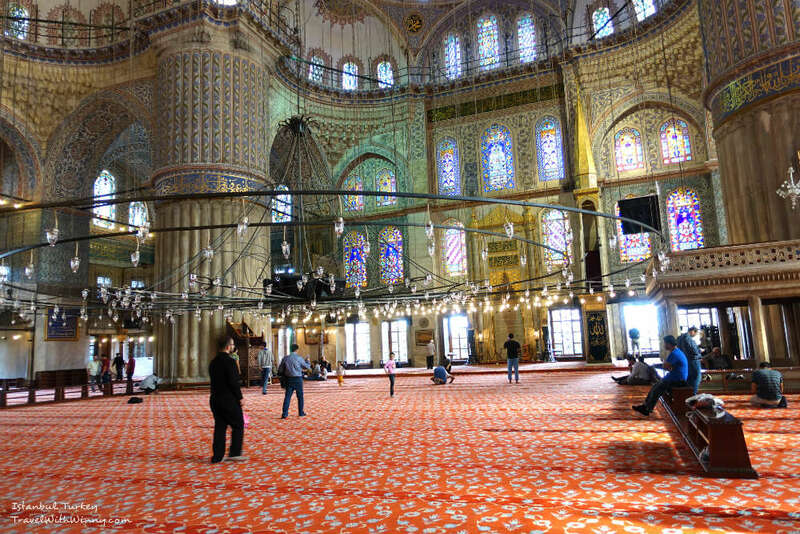 Initially I thought the Blue Mosque is blue due to the appearance not the interior. 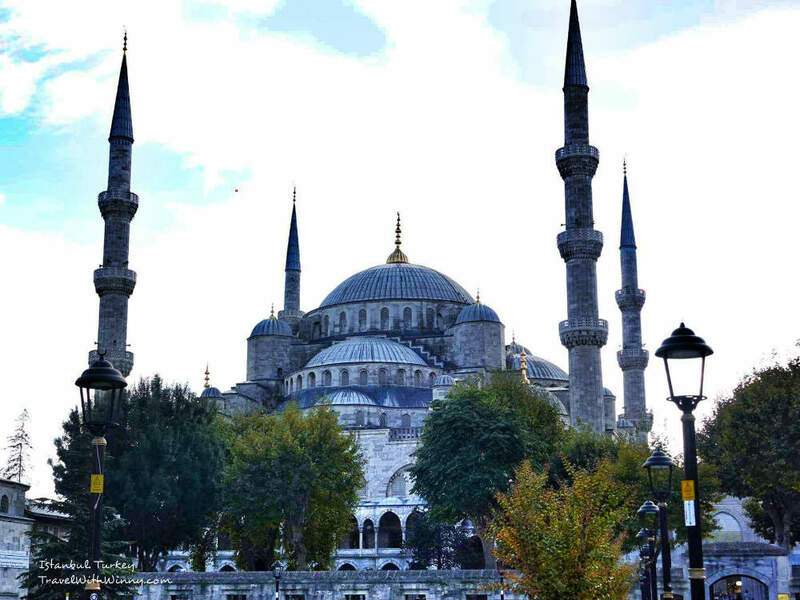 When one thinks of Istanbul, Sultan Ahmed Mosque is usually the first building that comes to mind. It is commonly known as “The Blue Mosque” due to its beautiful blue Iznik tiles that decorates the interior. 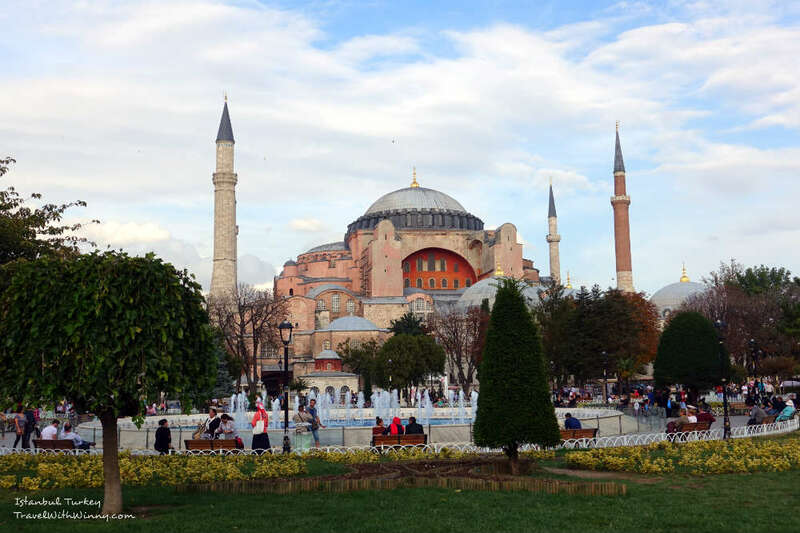 The Blue Mosque is located directly across to Hagia Sophia. 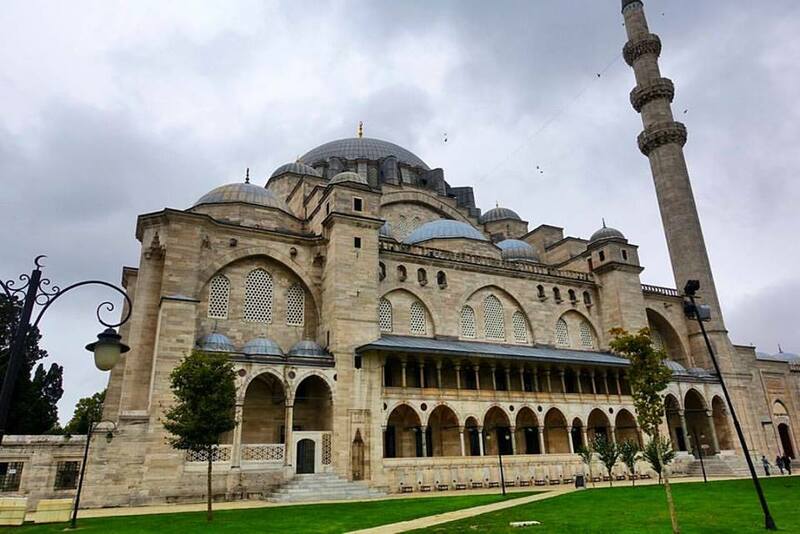 Before coming here, you should visit the Blue Mosque website and check the prayer time as non-Muslims cannot visit the mosque during those times. Beautiful blue Iznik tiles that decorates the interior. Wearing proper attire is important when visiting the mosque. Ladies needs to wear a headscarf. Before entering, the staff there will hand you a scarf if you don’t have your own. Males are not allowed to wear anything above their knees. For the days we visiting mosques, York had to wear jeans despite the hot weather. The rules of the outfits are clearly written. No flash photography are allowed inside and be respectful by avoiding taking pictures of those who are praying. If you do donate to the Mosque at the exit door, you actually get an official receipt for it. Muslims praying in the centre of the mosque. Blue Mosque was built in 1616 to rival the magnificence of Hagia Sophia. Features on the Blue Mosque reflects the Byzantine era architecture, like the Hagia Sophia, but they are also combined with Islamic elements. In total the mosque has one main dome, six minarets and eight secondary domes giving its unique appearance. Mom and I all got our own scarves! Ready for mosque visits any time! 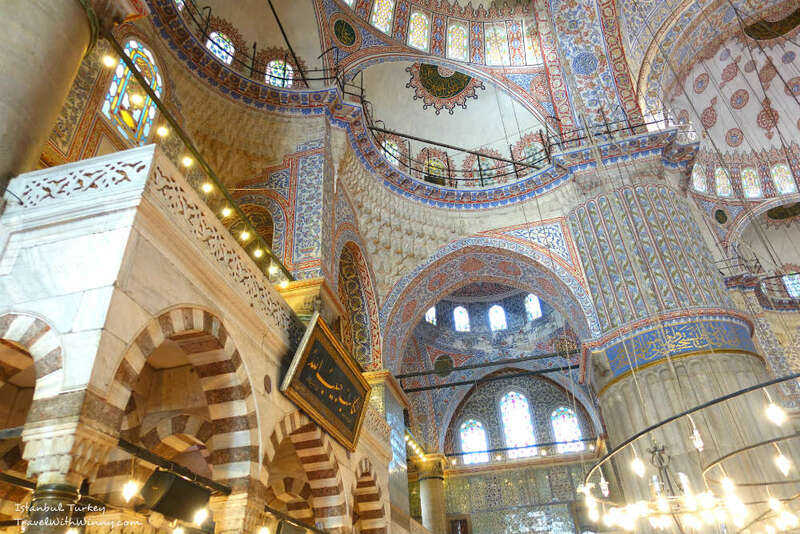 The Blue Mosque is the second Muslim place of worship to have a Pope visiting the mosque. Pope Benedict XVI visited the mosque in 2006 and stood side by side with the Mufti of Istanbul and Imam of the Blue Mosque. I thought it was very empowering knowing the Pope removed his shoes and closed his eyes for 2 minutes in silent meditation. 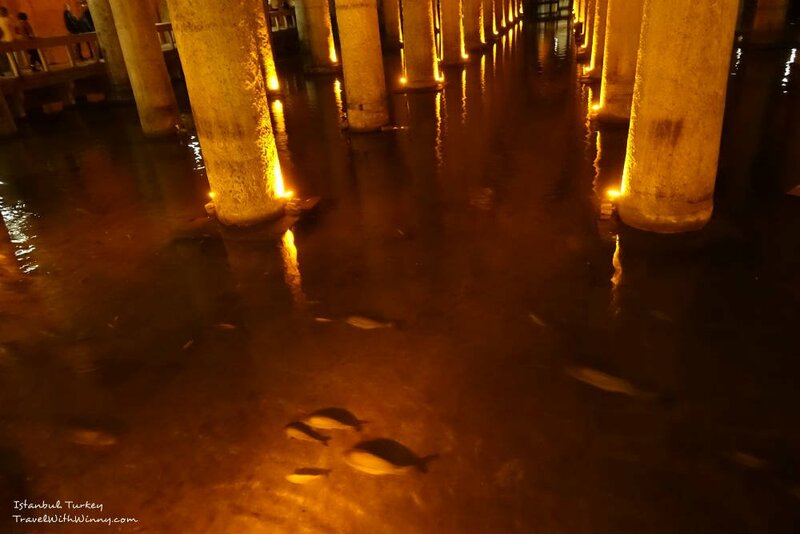 Nine meters below Istanbul lies Basilica Cistern. Basilica Cistern, also known as “Sunken Palace” by the Turkish people is the largest of several hundred cistern beneath Istanbul grounds. Located only 150m southwest of Hagia Sophia, it is the next destination to visit in the area. 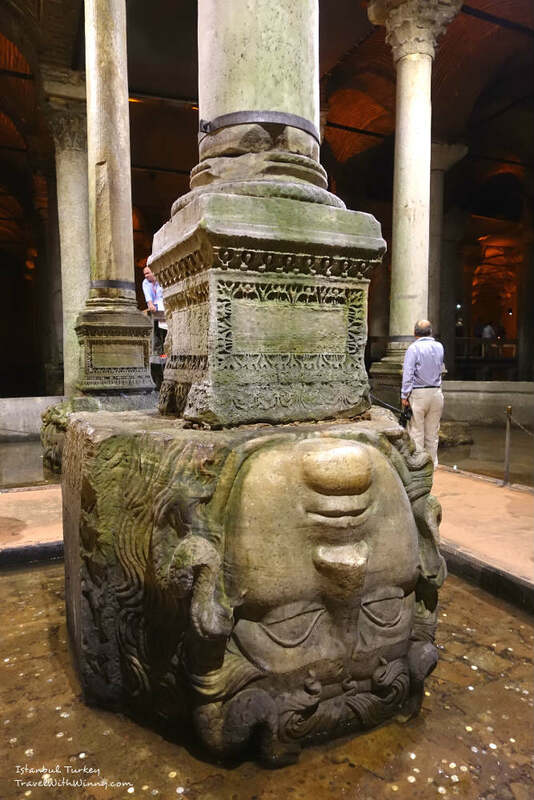 The exact location can be found on the Basilica Cistern’s website. The entrance of Basilica Cistern. We won’t have even found it if it wasn’t for the line of people waiting outside! Entrance fee for this place is 20 TL and it is not covered by the museum pass. However it is not a place you want to miss! 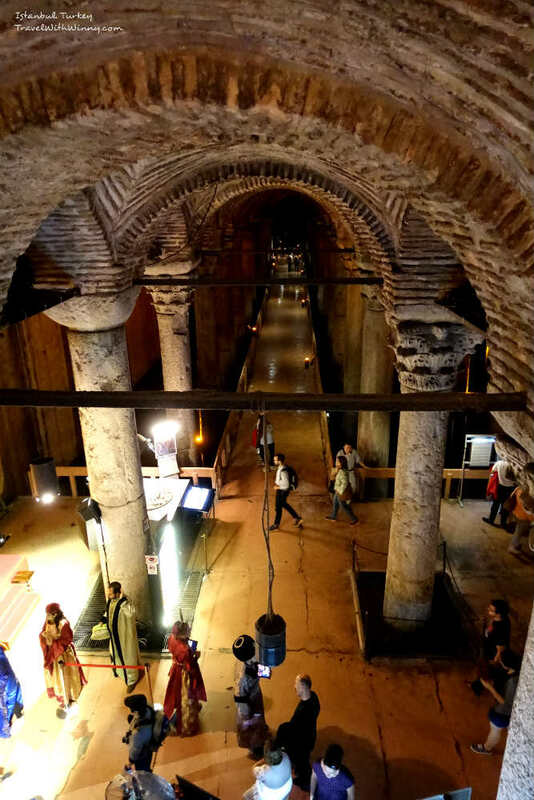 The Cistern will definitely WOW you once you walk down 52 steps (9 meter) below ground and see the 336 lit up marble columns. Looking down from the stairs and was surprised how grand this place is! The place was built in the third to fourth century as a basilica with underground gardens. 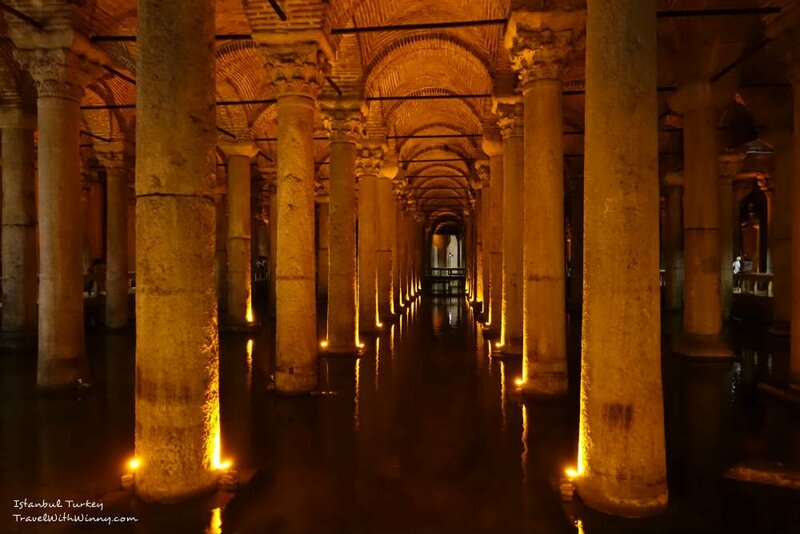 After the Ottoman conquest in 1453, the basilica was converted to a cistern to provide water to the Tokpaki Palace and other buildings in the area. I was surprised to actually see fishes swimming underground! The cathedral-size cistern is around 9800 square meters and is able to hold 80,000 cubic meters of water! It currently only holds a small amount of water lining the bottom. Some sections even have fish in them! The Basilica Cistern is quite cold being underground. It has a cafe near the exit and a photography store where you can dress in Ottoman style. One of the two Medusa columns, still a mystery why it’s placed there. Two columns located on the north-west corner of the cistern has Medusa carvings on it. The heads are oriented sideways so the gaze of the Gorgon will not turn you into stone. There’s also a column engraved with Hen’s Eye and tears, this engraving is to pay tribute to the hundreds of slaves who died during the construction of the cistern. The entrance of Topkapi Palace. The Turkish flag was half way that day due to the bombing that happened at Ankara. 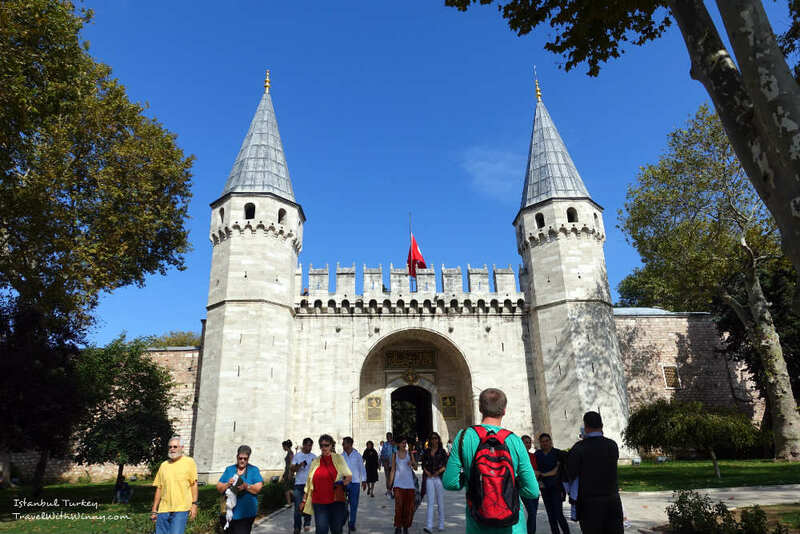 Topkapı Palace is the next major attraction! It is a UNESCO World Heritage Site since 1985. This palace was built-in 1453 during the Ottoman period and was used as a royal palace until 1856. After 1856, the emperor move to the more European style Dolmabahçe Palace which is across the Bosphorus strait. 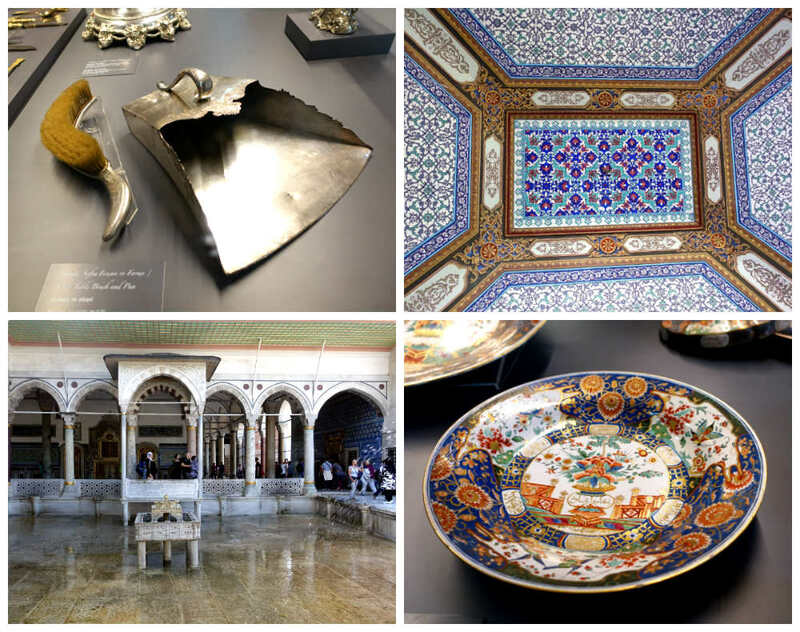 Topkapi Palace Museum has any artifacts from different eras. The Ottoman Empire was so rich, even the dust pan was made out of silver! 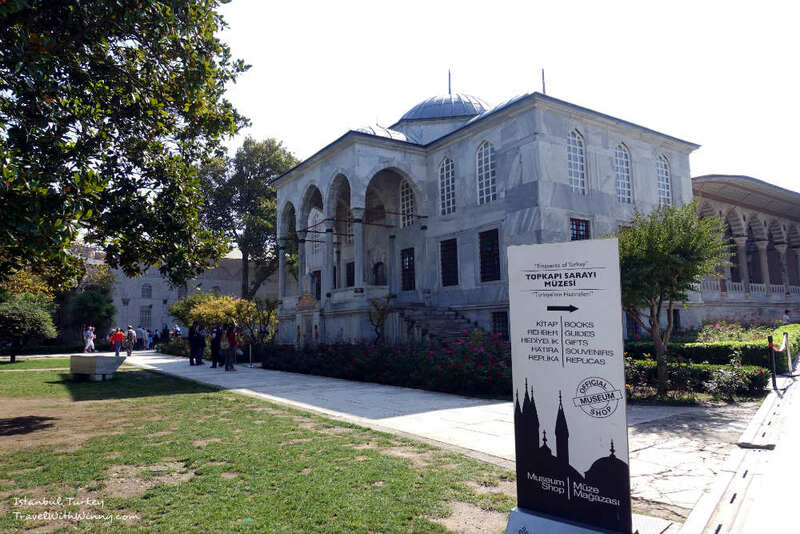 Topkapi Palace is open everyday except Tuesday and the museum pass is accepted here. Admission ticket without Museum Pass is 30 TL. The palace has a large collection of weapons, porcelain, Islamic manuscripts, Ottoman treasures and jewelries. The collection included many gifts from many different countries, including the Chinese porcelains and French/English tea sets with Islamic manuscripts on them as gifts to the Ottoman Empire. 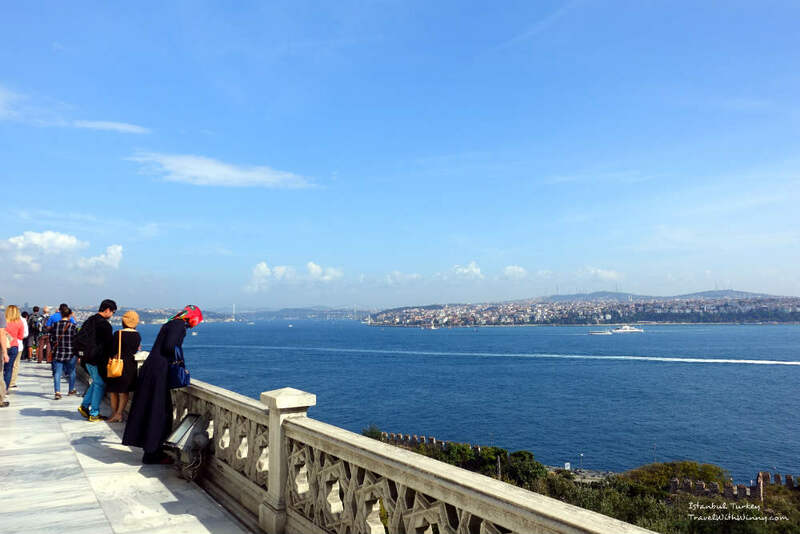 The view of Bosphorus Strait behind Topkapi Palace. If you are fascinated by mosaic tiles, then this place will amaze you! The whole palace is decorated by mosaic tiles. On the huge balconies behind the palace, there is an amazing view of the Bosphorus strait! don’t be frightened by the large amount of tourists at the front. There are a lot less people when you walk further in. Lots of museums and shops within the grounds of Topaki Palace. The museums are open everyday according to the official website and costs 15TL without Istanbul Museum Pass. The museum houses over one million objects and has a very good rating on Trip Advisor. 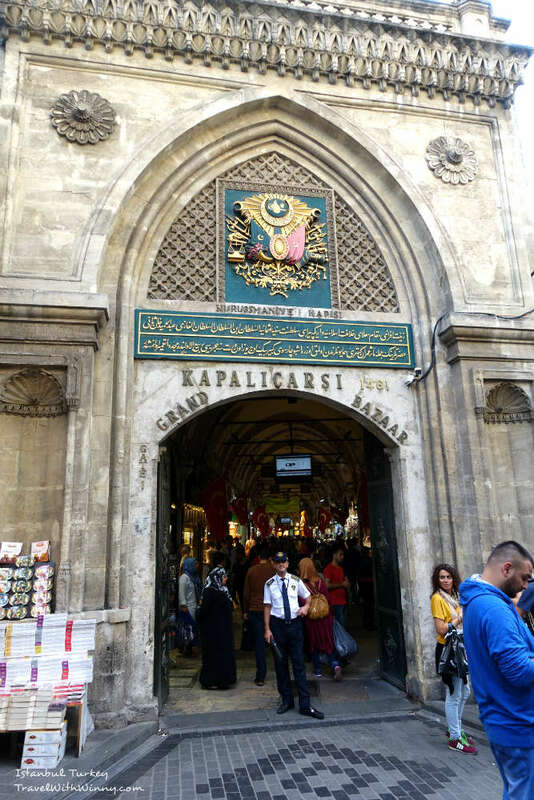 I really wanted to visit the museums and they were close by, but after Topkapı Palace, my parents had enough of museums, so we ended up heading towards Grand Bazaar. One of my favourite mosaics in the museum. Near Grand Bazaar there is a small museum included in the Istanbul Museum Pass called “Istanbul Mosaic Museum“. The ticket price is 10TL without the Museum pass. 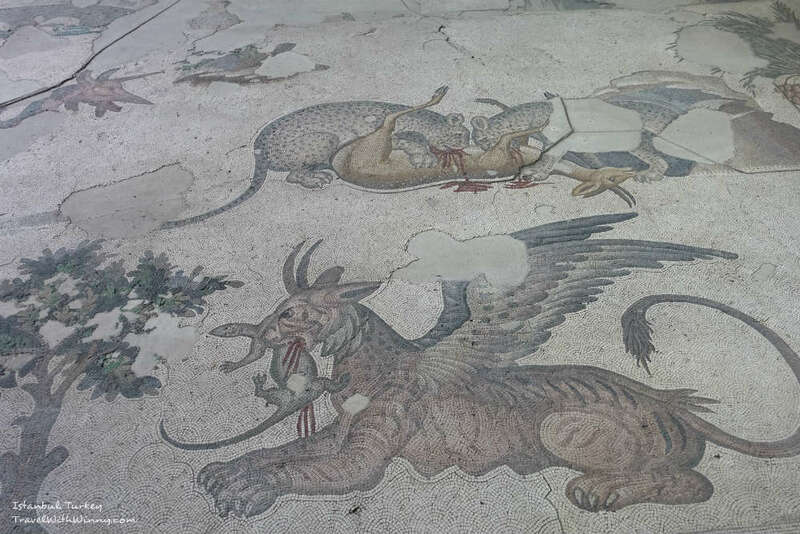 The museum house mosaics found from a site in the Great Palace of Constantinople which was constructed in the Byzantine period. This museum is quite fascinating but not a necessity to make a trip here if you don’t have enough time, as you will see a lot of mosaics from other museums already. 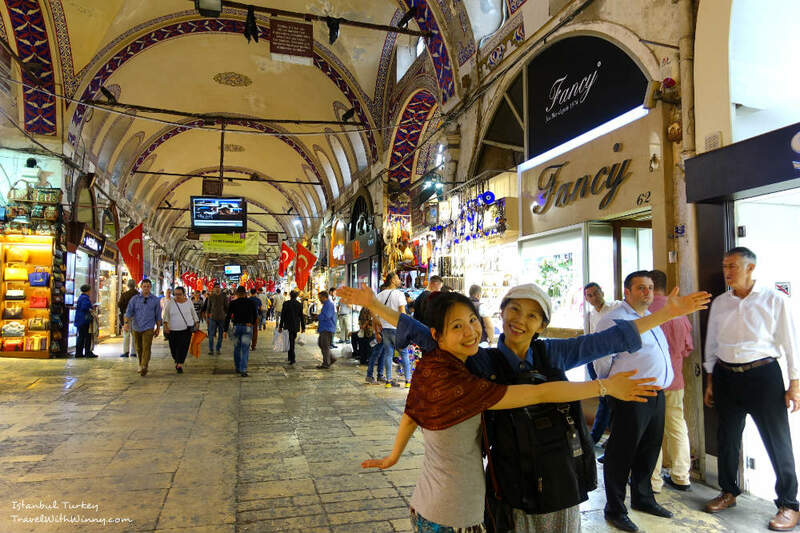 One does not complete their visit in Istanbul without visiting the Grand Bazaar! It is one of the oldest and largest covered market in the world! A total of 61 covered streets allows you to shop till you drop in any kind of weather! There are over 3000 shops and was listed as the number one most-visited tourist attractions in the world in 2014 with 91,250,000 visitors in that year! If colours and shopping are your things, you will love this place! It is open everyday from 9.00 am to 7.00 pm (website) except Sundays. 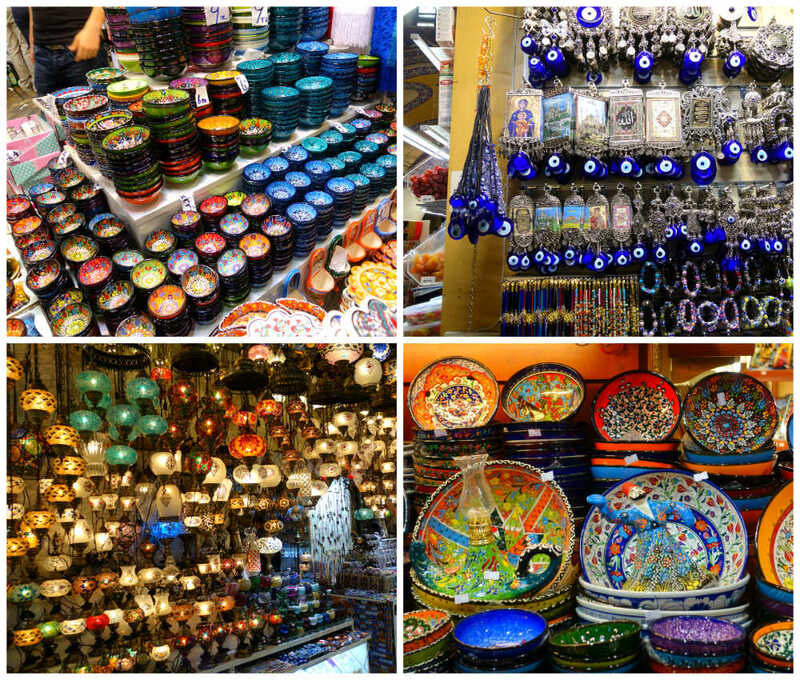 It is probably one of the best places to buy souvenirs from Turkey as the specialty stores are concentrated, making their price competitive. Despite being under the roof, the Grand Bazaar’s floor is much cleaner than I thought! Example of goods you can buy includes but not limited to: stained glass lanterns, silk scarves, painted ceramics, carpets, jewelries, leather goods and Turkish sweets. The choices are unlimited! Give yourself plenty of time to shop if you are interested in these kind of things. Suleymaniye Mosque is so grand! No wonder it is the largest mosque in the city! 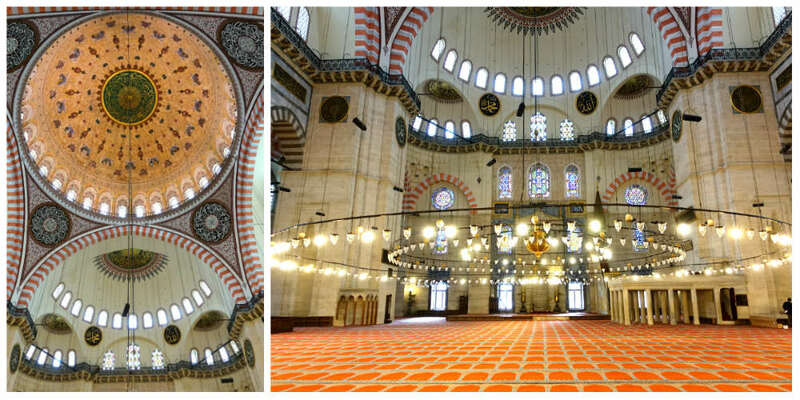 Other than the Blue Mosque, Süleymaniye Mosque is another well known Mosque in Istanbul. It is the largest mosque in Istanbul completed in 1558 by the Ottoman empire and it is located on the Third Hill of the city near the Istanbul University. The courtyard of the mosque, proper attire is not needed up to this point. Just like the Blue Mosque, appropriate attire is required to enter the mosque. 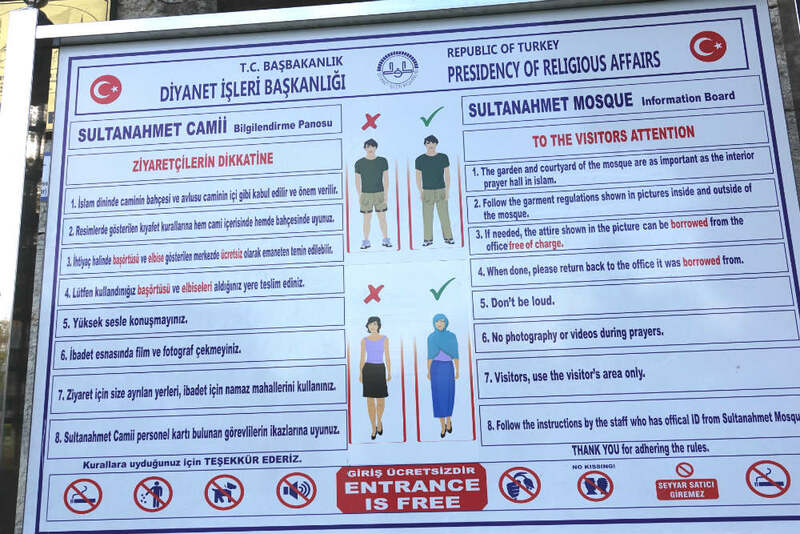 The visitors are allowed to enter the mosque from the front door which is different to the Blue Mosque. I actually like the Suleymaniye Mosque more than the Blue Mosque as it appears more grand, the place was a lot quieter and wasn’t flooded with tourists. I believe less tourists come to this mosque as it is a little bit further away from the touristy areas. The Mosque felt serene at around 10.00 am in the morning. Inside of Suleymaniye Mosque. Without the bustling of the tourists, it is nice to enjoy the serenity of this place. The imperial mosque includes a hamam (Turkish bath), medrese (Islamic school), a hospital and a caravanserai (inn for travelers and traders, however closed to the public). The central dome is 53 meters high, 59 meters in length and 58 meters in width with 200 stained-glass windows. It was very impressive! I think this is a secret photography spot for Istanbul photographers. The most amazing view of the Bosphorus strait could be seen just outside the mosque. Because the mosque was located on one of the highest point in Istanbul, it provided the perfect location for photography enthusiasts. 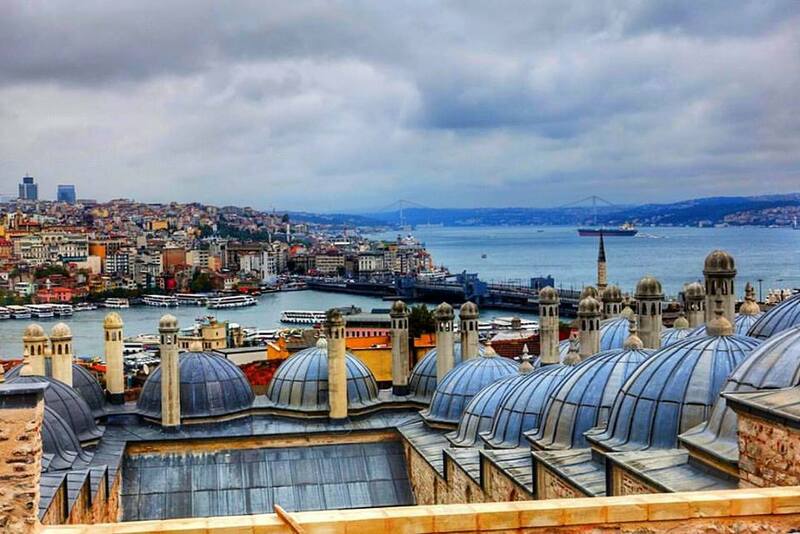 Beautiful view of Bosphorus Strait from Suleymaniye Mosque. 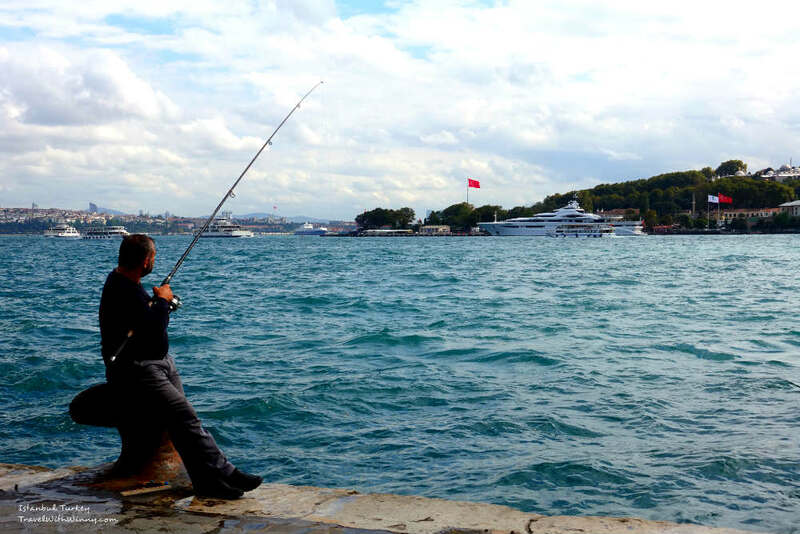 A ferry ride touring Bosphorus Strait is one of the most recommended activities in Istambul. You can get up to 25% discount with Sehir Hatlari according to the additional discount offered on the Museum Pass website. Cannot comment on the experience since my mum doesn’t like boat-rides. 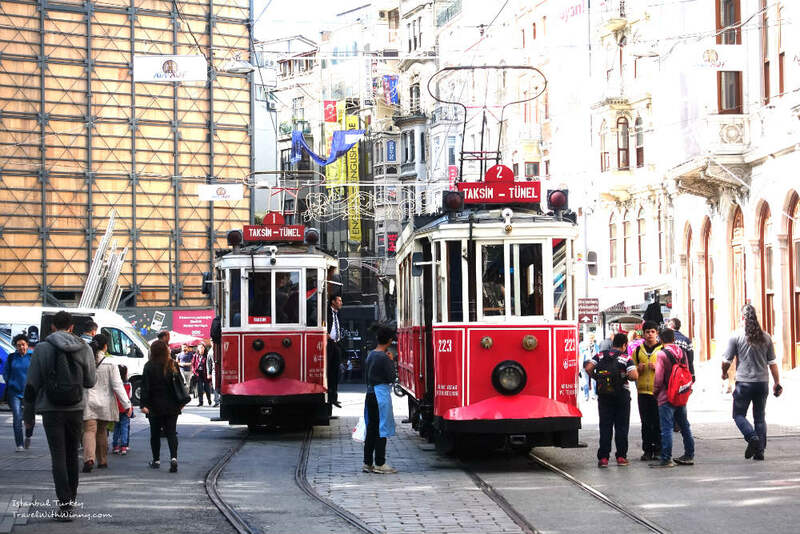 If you make your way towards Beyoglu from Old Town by either tram or on foot, you will enter a district located on the European side of Istanbul separated by the Golden Horn. You can also arrive on the other side of Golden Horn to Beyoglu if you take the Bosphorus strait boat ride. Entering Taksim, the heart of modern Istanbul. 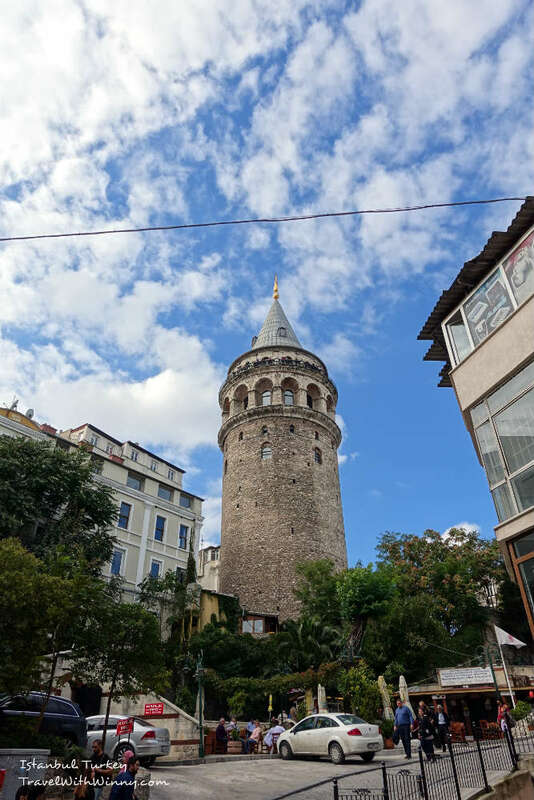 Galata Tower is one of the striking skyline landmark in Beyoglu. This medieval stone tower built-in 1348 is nine-story tall (66.90 meters in height) and costs 25 TL to go up the tower. Apparently the views are great from the top. However, we had many “great view” moments already, especially we live at Hilton Istanbul Bosphorus which is located on a hill top close by, so we only took some photos from the main square at the front. Galata Tower taken from the main square at the front. 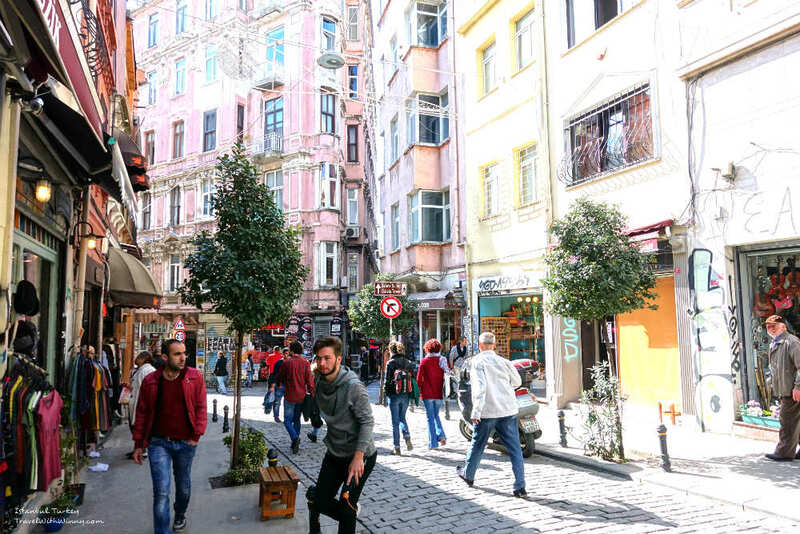 Taksim is considered to be the heart of modern Istanbul. This is where all the high-end restaurants, shops and hotels are. There is a long pedestrian shopping street with a nostalgic tram that can take you up and down this street. The ride on the nostalgic tram is 1.75TL but the total distance of the line was 2.6km, so we decided to walk instead of taking the tram. 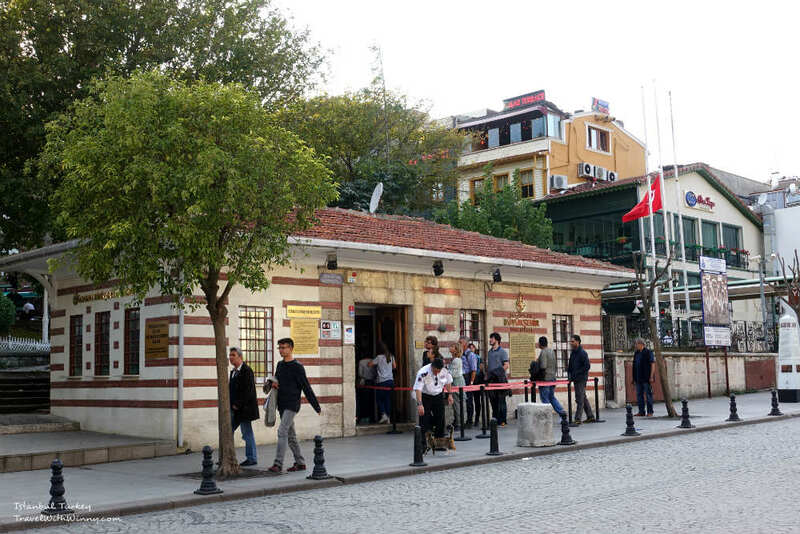 Taksim also has the world’s second-oldest subway line after London’s Underground. The world’s second-oldest subway line. Taksim Square is an important venue for political protests, often used as a starting point or destination for political demonstrations. It is also a place for gathering on New Year’s Eve, Republic Day celebrations, etc. There’s nothing much to see here other than a The Republic Monument and pigeons. 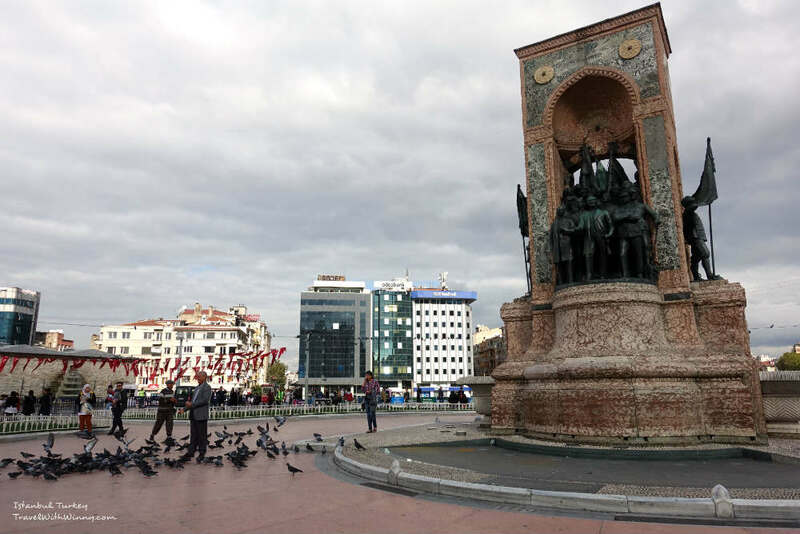 Taksim Square with the Republic Monument and pigeons. Dolmabahce Palace is another Palace that I planned to go but never made it there after my parents learnt that the palace is European style. Their commented that “It can’t be better than Buckingham Palace!”. so… With that remark, I never had the chance to compare the two. It is located along Bosphorus strait on the European side of Istanbul near Beyoglu. It is the main palace for Ottoman Empire from 1856 to 1922 after the royals decided to move out of Topkapi Palace. It costs 40 TL to get in and it is not included in the Istanbul Museum Pass. According to Trip Advisor, the wait is usually quite long so get in early. Dolmabahce Palace is along the Bosphorus Strait. As you can see we only spent 75TL value from our Istanbul Museum Pass due to my parents interests. However if you include other museums around the area and have more days in Istanbul, you can easily justify the value of the pass. Two days in Istanbul is simply not enough!